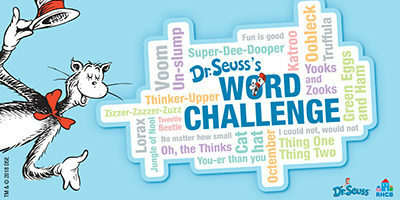 Participants will have the opportunity to join Word-A-Thon events at local bookstores, complete with reading activities, and enter to win prizes on Seussville.com. Scripps National Spelling Bee and Carnival Cruise Lines are partnering with RHCB and DSE to support the challenge and track words this summer. The Scripps National Spelling Bee is promoting the Word Challenge at the annual national competition held outside Washington, D.C., happening this year May 27–June 1. Events will include a Word-A-Thon, a Dr. Seuss–themed spelling bee to be streamed live on the Bee’s Facebook page, as well as fun activities and special appearances by the Cat in the Hat at the Dr. Seuss Bus that will be on-site. Carnival Cruise Lines is challenging consumers to read the most Dr. Seuss words at sea beginning in early June. Carnival will host two large-scale events promoting the challenge on board, one in June and one in July, and will track the words read on board by guests, adding them to the word widget on Seussville.com. Penguin Random House employees are not eligible to enter Dr. Seuss’s Word Challenge Sweepstakes, but if you would like to support the challenge and spread the word, please share the #SeussWordChallenge on social media. As a reminder, if you are posting to a personal or other non-PRH account you must include the hashtag #TeamPRH.